Christienne Fallsview Spa located inside the Sheraton on the Falls hotel. Sheraton on the Falls is pleased to announce that Christienne Fallsview Spa is currently recognized as the #1 Spa & Wellness Centre in Ontario on TripAdvisor. 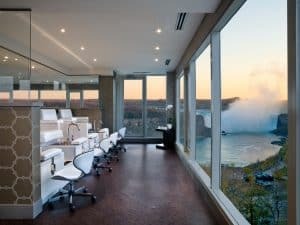 Located inside the Sheraton on the Falls hotel, Christienne Fallsview Spa is a world-class destination that features signature treatments and sweeping views of Niagara Falls. Christienne Fallsview Spa is also home to a one-of-a-kind Fallsview Hydrotherapy Infinity Tub and Relaxation Lounge, and is Niagara’s exclusive carrier of GUINOT skincare products. And to enhance each relaxation experience, the spa offers special seasonal treatments like the current Avocado Lime & Honey Manicure, a eucalyptus scented steam room, dry sauna, custom blended teas, Farmhouse Fresh beauty products, and more. “It’s an honour to be recognized by TripAdvisor travelers as the #1 Spa and Wellness Centre in Ontario. Our spa team, led by Diana Venturini, is dedicated to providing exceptional services that leave guests feeling relaxed and rejuvenated, and will continue working to provide unforgettable experiences in beautiful Niagara Falls,” says Sarah Vazquez, Vice President of Business Development and Marketing at Falls Avenue Resort. Christienne Fallsview Spa has also been recognized as one of the Top 25 Spas in Canada by Spa Magazine’s Canadian Spa and Wellness Awards, and is a multiple recipient of TripAdvisor’s Certificate of Excellence Award as a result of consistently great reviews from TripAdvisor travelers. This Niagara Falls spa is a world-class destination that you won’t want to miss on your next visit to Niagara Falls!